In 2015 I was twice in Kobanê and saw how inhabitants returned to the ruins of their hometown. They felt liberated from ISIS and Assad. And while the war was far from over, different population groups worked together to create a better future for all children. Since then, ‘doing nothing’ has not been an option for me anymore. Especially the resilience of the women has made an indelible impression. As long as I can, I will be involved in building a bridge between Eindhoven and Kobanê. These women deserve our support. And I wish for the inhabitants of Eindhoven that they can experience something of their perseverance and ideals. 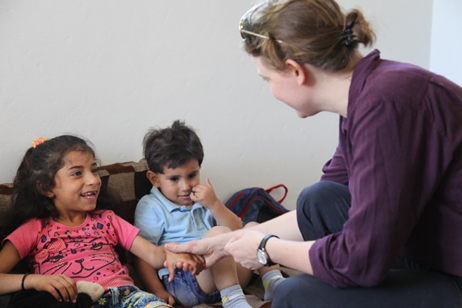 In September 2016, the women’s council opened a school for disabled children in Kobanê. Under the Assad regime there was nothing for these children. They rarely come outside. They realize that they are a burden to their families and experience fear and tension from the war. The name of the school is Hîvî, which means Hope. The women ask: “give money for education to these children” and “tell our story to others”. A little earlier Eindhoven~Kobanê had started as a working party of the Vredesburo, with a project description, its own Facebook page and about 5 volunteers. Our first activity was a public meal on the steps of the Catharinakerk during the annual Peace Week in September 2016. After that we were present with photos, flyers, scarves for sale and a collection box at all kinds of local events; neighbourhood meetings, outdoor play days, various colourful festivals etc. I was invited for a presentation at the Rotarians and church services. The excellent chefs in the workgroup were invited several times to prepare meals. On our own initiative we organized a benefit concert in May 2017 with the help of many. The beautiful musical program, the extraordinary acoustics of the Catharinakerk and especially the atmosphere of solidarity to which all present contributed, made this meeting an unforgettable highlight. The following events deserve special mention. 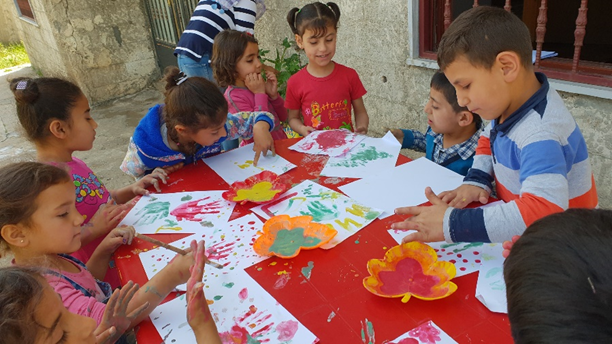 On the occasion of a lecture on Kobanê, group 8 of OBS Merlijn in Nieuw Vennep organized a fantastic fancyfair for all pupils and parents at the end of the school year for the benefit of the school Hîvî. After two short presentations at meetings for people who are looking for voluntary work, the working group was strengthened with new volunteers from different parts of the world. The year ended festively with a photo portrait of Gulay our cook on the ‘Wall of Fame’ of Eindhoven Doet. Shortly after the start of the workgroup we received from an old woman in Valkenswaard some bags full of warm knitted ties and scarves. In 2017 one of our volunteers joined the Network of Friends of the ‘Ik Wil’ Foundation. These friends try to speak Dutch together, while they knit colourful shawls, baby clothes etc. and hooks with patterns from different parts of the world. Part of their product are now for the sale of Eindhoven~Kobanê. Also from the Living Room for refugees without living space, we got a supply of cheerful ties and hats for children. Part of this we gave to a transport for refugees from Afrîn in the Shahba North Syria. 2018 started with an invitation from 6 PKN municipalities in Kempenland. 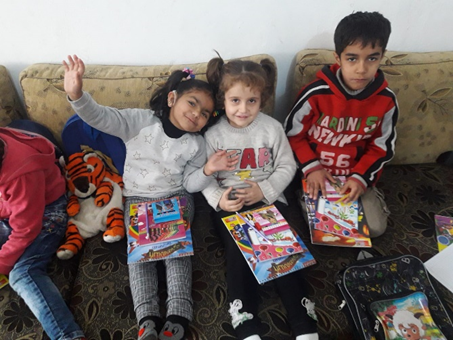 On January 28 our volunteers were present in 3 different churches and in all churches were different kinds of information and Syrian refreshments. 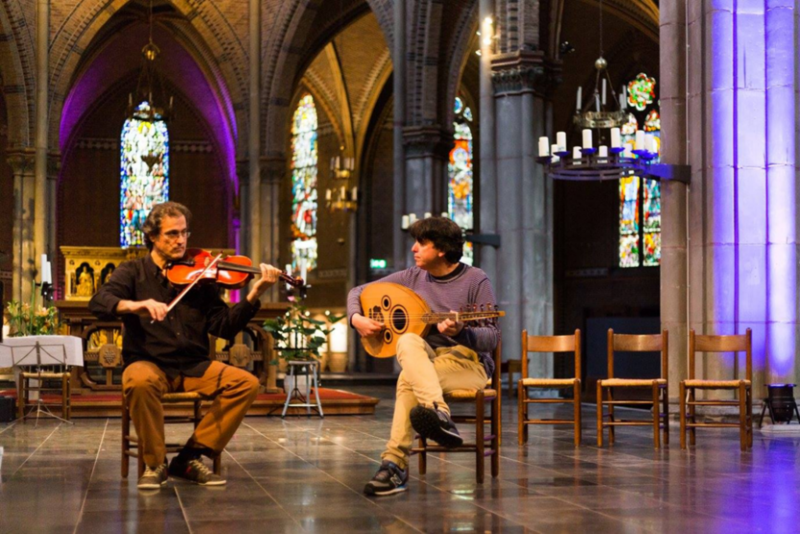 In March 2018 two Popular Parliaments by artist Jonas Staal were opened, one in the city of Dêrik in Rojava (northern Syria), and one in the Van Abbemuseum. At the opening in Eindhoven, seven working parties of volunteers recited in seven different languages from the Social Contract of Democratic Self-Government in Northern Syria and there was a short lecture about our involvement with Kobanê. In a year and a half we have had face-to-face contact with about 1600 people. These people gave a total of €12.500 ! For political reasons, northern Syria became increasingly isolated and contacts with the Council of Women and the Hîvî school became increasingly difficult. In April 2018 Renée in der Maur – employee of the ‘New World Summit’ – could travel again. She has a lot of experience in the region and is involved in the construction of the People’ s Parliament in the city of Derik. 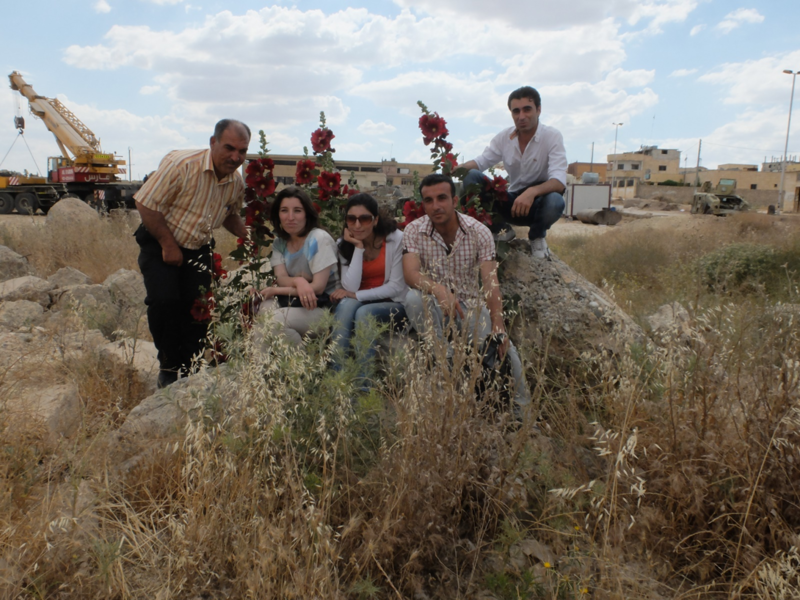 As project manager for our working group she stayed in Kobanê for several months. School Hîvî rents a building in a village near Kobanê. Here 16 disabled children aged 4-12 years receive education and therapy. The small-scale approach of very committed teachers and therapists makes these children come alive. The Women’s Council and the school board consult with Renée about the spending of the money from Eindhoven. The amount is much more than just some teaching material. For €6000 a building in the centre of Kobanê is rented, refurbished and furnished. There is room for 50 students. And because of its location, it is more accessible for all concerned. The school will open at the beginning of July. Winter 18/19 there are 25 pupils and the number is still growing. A limiting factor is the number of teachers. Teaching to disabled children is considered inferior. Therefore it is difficult to find teachers for this beautiful work. Many students came to school without breakfast and lunch box. From the end of July the 6 school days start with breakfast for all students and later on a healthy fruit snack. Despite changing prices and exchange rates, this is possible for €400 per month. At trusted addresses, €5700 is kept, sufficient for about 12 months of school breakfast and the rent in July 2019. We hope to visit Kobanê ourselves in the spring of 2019. People live very isolated. The school management would like to get in touch with European schools and training institutes. This can be a simple exchange with photos and videos for and by students who give a picture of normal school days. But it is also useful to exchange teaching materials on, for example, health, nutrition and hygiene. The teachers work from their hearts and intuition but are eager to learn more about disability education elsewhere. In financial terms, school breakfast is number one. * musical instruments and sports equipment suitable for children with reduced mobility. * school uniforms made by local women cooperative. Children wear the same clothes every day. * medical therapeutic devices and operations. * A new school for all 200 disabled children in Kobanê. Meanwhile there are two members in the working group who speak Arabic and Kurdish. They regularly call the headmaster of Hîvî school. Through photos and videos we sympathize with the events in Kobanê and it seems as if we get to know some students personally. Since the sudden announcement – December 2018 – of the departure of American soldiers from northern Syria, our friends in Kobanê and we with them have been afraid of what is about to happen. Even under these circumstances, we cannot abandon teachers and children of HîvÎ school. In 2016 we just started with 5 people and gratefully accepted the invitations we received. Partly at the request of school Hîvî we want to work this year on contacts with schools. We have already developed a simple educational offer. 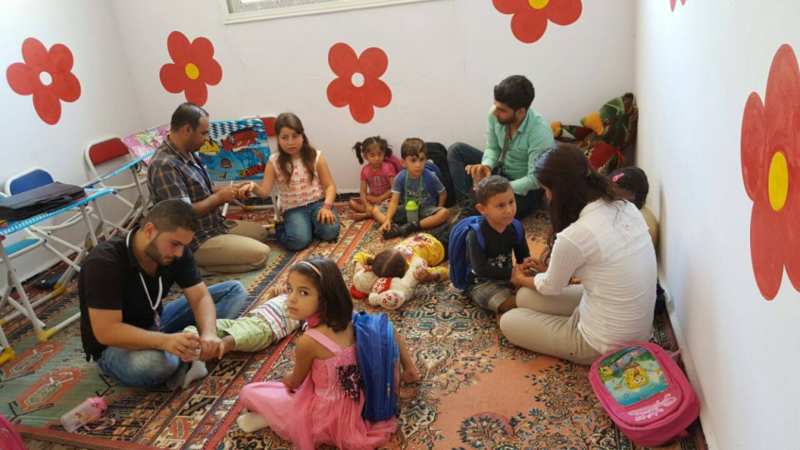 Meanwhile Eindhoven~Kobanê has grown strongly and now has 15 volunteers from almost all parts of the world. People with ties in the Middle East contribute enormously to understanding life in Kobanê. Dutch-speaking volunteers with some administrative and organisational experience are also very welcome. The example of cooperation between different population groups in Kobanê helps us to appreciate the differences within the working party. Multicultural cooking appears to be one of our specialties. And what unites us is the will to do something for children in a war zone. It seems like little, what we can do from Eindhoven. We can’t rebuild the city or stop the war. But all you can do is infinitely better, than standing by helplessly. We are grateful for the cooperation with everyone in Eindhoven and Kobanê. And we are happy for every child that can play and learn. Het Vredesburo is een ANBI.